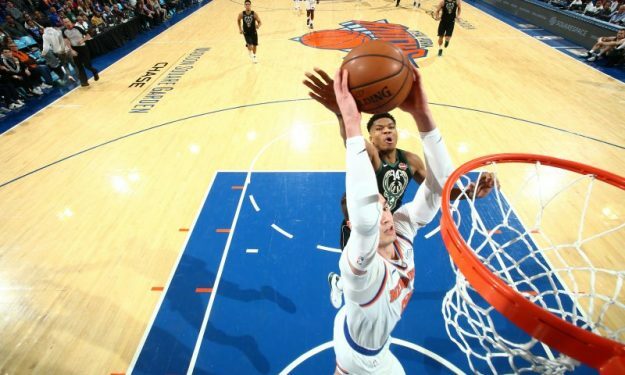 Giannis Antetokounmpo wasn’t happy at all after Milwaukee Bucks’ game with the New York Knicks. Mario Hezonja sent Giannis Antetokounmpo to the floor when the Greek Freak tried to stop him from dunking Saturday night and afterwards stepped over him. He really rocked his opponent, who usually is on the other side of this kind of jams. A few days before his 24th birthday, Antetokounmpo talked about the play after the game. In all seriousness, he said: “I’m going to punch him in the nuts next time”. “Honestly, if you’re afraid, this is not for you. I don’t want to be disrespectful, but if you feel fear this is not the place for you, New York is not a place for you and this team is not a place for you” Hezonja said. The Bucks lost in overtime after an Antetokounmpo missed shot. However, Giannis did pour 33 points, grab nine rebounds and dish seven assists in 42 minutes.